Based in Austin, Texas, Honor Flight Austin has successfully and proudly taken over 2000 veterans to our Nation’s Capital to visit and experience the Memorials built in their honor. With your continued help, resources are pooled together, experiences are shared and alliances are formed throughout Central Texas to continue our noble cause. Please help us continue to make their dream of visiting THEIR memorials, a reality. All donations to our all-volunteer federal, nonprofit, 501(c)3 organization are tax deductible. It is because of supporters like you, we’re able to continue these historic flights! 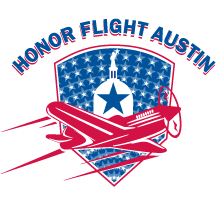 Help Honor Flight Austin say “Thank You” to our Veterans with a Trip of a Lifetime. Our WWII Veterans statewide will continue to receive first priority. We are asking for your help finding every willing and able World War II Veterans in Texas so we can fly them to Washington D.C., free of charge, to see their WWII Memorial. We are also taking Korea Veterans and Vietnam War Veterans from the 14 surrounding counties to participate on our flights. “We want to let our most senior Veterans know that we did not forget and will not forget their service and sacrifice.” Allen Bergeron, Former Chairman of Honor Flight Austin. You can find and fill out a Veteran Application here. You can also refer a Veteran for “A Trip of Lifetime.” Simply provide your Heroes name, contact information in the contact form to the right, and we’ll take it from there.